BANJUL, Mar 30 2014 (IPS) - The countdown to the Gambia’s 2016 general elections has begun with a rare move to bring together female politicians from across the divided political spectrum to ensure increased female representation. This week, local women’s rights NGO Gambia Committee on Traditional Practices Affecting the Health of Women and Children (Gamcotrap) launched a campaign calling for political reforms to ensure the effective participation of women in all positions of political leadership. “We are now saying that we want to fetch our own water and drink with men from the same well,” Dr. Isatou Touray, executive director of Gamcotrap, tells IPS. The NGO has received support for the campaign from the National Endowment for Democracy, a U.S. non-profit that supports freedom across the world. “What we’re doing has nothing to do with partisan politics,” says Touray. “It’s not about disempowering men. It’s about development, and it’s about gender politics. The preliminary results of this tiny West African nation’s 2013 census show that women constitute more than 51 percent of the country’s almost 1.8 million people. As of 2011, women represent 58 percent of national voters. Their numerical strength is not, however, reflected in the number of women in governance and leadership positions at both national and local level. This is despite the fact that the Gambia has a female vice-president, Dr. Isatou Njie Saidy, who has held the post since 1997. “Out of 53 National Assembly members, we have only four who are elected and one nominated female deputy. That’s nine percent,” Amie Sillah, a gender activist and politician, tells IPS. The structures within various political parties, at best, relegate women to being permanent deputies of male propagandists. Women mostly only hold leadership positions in the female wings of their political parties. And the majority of politically-active women here spend their time campaigning for votes and financial donations for their male counterparts. “In the selection committees of parties, even if a woman is made chair, as our proverb goes: ‘They [men] give you the head and take out the tongue’, so that the woman is not able to speak out. Men give you just a nominal power. In a nutshell, you propagate what they want you to,” Sillah says. The Constitution guarantees women’s right to participate in politics and criminalises any form of gender-based discrimination. Over the past four years, at least three pro-women laws have been passed: the Women’s Act of 2010, the Domestic Violence of Act, and the Sexual Offences Act, both of 2013. Yet, women remain politically marginalised. Activists say that because men dominate the political scene, the pro-women’s legislation has been watered down. Sillah called for an affirmative action quota system for the National Assembly that will allott at least 30 percent of seats to women. Haddy Nyang-Jagne is one of the four female members in the National Assembly from the ruling Alliance for Patriotic Reorientation and Construction (APRC). She thinks that the government has done a lot to ensure women’s participation in politics and that one of the reasons for the low number of women in parliament is the existing cultural barriers. “Is it lack of funding? In APRC, money is given to candidates…Sometimes, it’s about religious and cultural barriers. Some people would tell you our religion of Islam does not accept women taking part in politics and we know that proposition is unfounded,” Haddy, who is serving her second term in the National Assembly, says. However, women from the opposition say that the democratic space for vibrant multi-party politics has shrunk as arbitrary arrests and detention of opponents have become the norm. 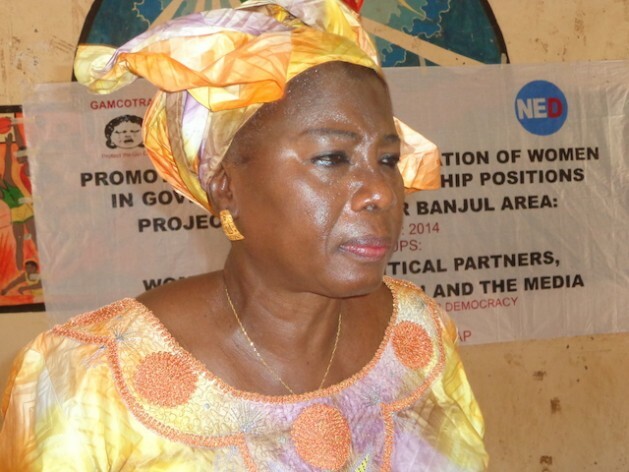 Mariama B. Secka, the secretary-general in the opposition United Democratic Party’s female wing, explains that it is hard to be part of the opposition in the Gambia. The country has been a one-party dominant state since 1996 when army leader and now President, Yahya Jammeh, formed the APRC after he took power in a 1994 coup. “I was invited to a forum by the women’s federation. When I started introducing myself as a member of opposition party, I was heckled. I was totally harassed. It’s not easy at all. We need a more level playing ground,” she tells IPS. And the only people who can change this are the country’s majority female voters. But Touray is optimistic and doesn’t rule out the possibility of a female presidential candidate for as early as the 2016 presidential elections.